Happy Birthday William Carlos Williams! Born September 17, 1883. 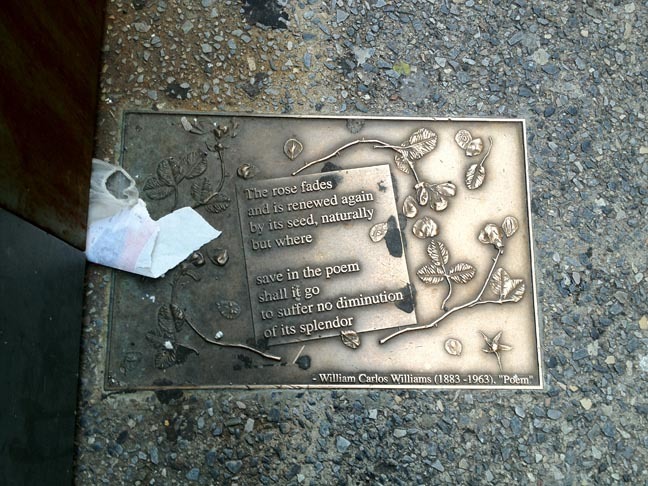 The William Carlos Williams poem, Poem is one of the few poems on Library Walk that is cast in its entirety. Available in The Collected Poems of William Carlos Williams: 1939-1962, Williams compares the life-cycle of a rose to the life-cycle of man and the importance of poetry in capturing those moments thereby rendering them immortal. He does all that in 27 words! Though born in Rutherford, New Jersey to an English father and Puerto Rican mother it is Paterson that William Carlos Williams made famous through his famous five volume ode, Paterson. The books were published separately in 1946, 1948, 1949, 1951 and 1958, and collectively as one volume in 1963. When the National Book Awards were re-instituted in 1950, Williams was the recipient of the first award for poetry. From Ezra Pound to Allen Ginsberg, Paterson, New Jersey's favorite son William Carlos Williams was influenced by and an influence on American poetry in the 20th century. Wanting to move away from European poetic sensibilities he altered meter and lineation in his poetry on his quest to create a truly new American poetic form that looked at issues common to the average American. With his college classmate Pound he helped form the Imagist movement in the 1910s. Towards the end of his career and life he wrote the introduction to fellow New Jersey son Ginsberg's seminal Howl as a new generation of poets were influenced by his poetry. Whether it be a birth day, anniversary or publication date of a seminal work, the Bar None Group will revisit these 40+ quotations from time to time — quotations that inspire one to write, read, explore and embrace literature. We last visited poet and native New Yorker Muriel Rukeyser.